The Kobo Aura from the front looks identical (albeit slightly smaller) to it’s bigger brother – the Aura HD. The back though is different going from the grooved back of the Aura HD to a kind of slanted back. It also has a more textured back which has a nice pleasant feel to it when reading. Like the Aura HD there aren’t any buttons on the front and page turns are performed by a swiping motion. Along the bottom of the device there is a micro USB for transferring data and charging, micro SD card slot (capable of handling 32 GB of storage) and a hard reset button. On the top you have an LED indicator light, glowlight activation and the same orange power button/standby button. The Aura comes in slightly slimmer at 8.1 mm compared to the HD’s 11.7mm and weighs 174g compared to HD’s 240g. The obvious difference with the HD is that the Aura has a 6 inch screen rather than a 6.8 inch screen. It still uses the Clarity Screen display, but the resolution drops to 1014 x 758 and 212ppi, putting in it in the same class as the Kindle Paperwhite, Nook Glowlight and Kobo Glo. The built-in light is Kobo’s 3rd generation front-light technology and is the best yet seen on any Kobo including the Kobo Aura HD. It is accessed by pressing the button at the top to turn it on. Even on it’s lowest setting it is still possible to read it in the dark. This is one of the whitest lights we’ve seen and easily on par with the Kindle Paperwhite 2 with a uniform spread of light across the whole screen. Feature wise it is identical to the Aura HD so this part of the review remains the same as the review for the Aura HD, except when it comes to the PDF experience (see below) The main home screen on the Kobo Aura HD is very different from previous iterations of the company’s line of eReaders. The icons here are all dynamic so as you access menus and features it will change. 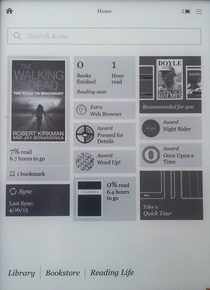 With recent web browsing history, new books added , shelves and a sync button. The sync button remains consistent which means if you make purchases on the website or with apps on your iPad or Android tablet it will sync all your eBooks. There is also a shortcut battery life, help, Wi-Fi, sleep and power. You can also configure the illuminated glowlight functionality to automatically shut off as well as configure sleep when the device powers off. So if you tend to read maybe 15-20 minutes before you go to bed at night you can make it so the battery drain is negligible by automatically turning the glowlight off. 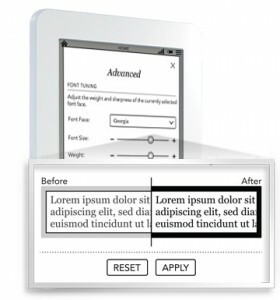 PDFs render on the Aura better than they do on the Kindle Paperwhite. Also with the Kobo there’s a page-turner there so you can actually turn the page and maintain that level of zoom. That’s important because a lot, about ninety-five percent of the eReaders on the market when you find that sweet spot you often lose all your settings when you turn to the next page. Kobo has now overtaken Sony in terms of an eReader that offers the best reflow. 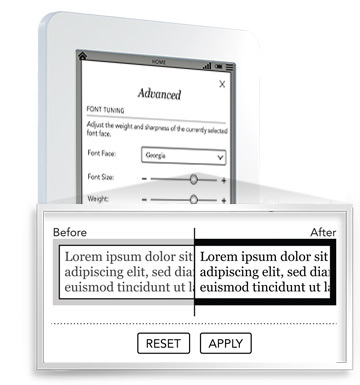 There’s no pinch and zoom but you can turn pages flawlessly, you can do quick navigation, look up the table of contents, select what chapter you want to go to and there’s an add to shelf but there’s really not too many up ways to change text reflow. However due to the smaller screen it isn’t quite up to the reading experience of the Aura HD, but still better than the majority of the other 6 inch eReaders. The Kobo Aura is priced between $139.99 and $149.99 with both Amazon and Rakuten.com (formerly Buy.com) coming in the cheapest ay $139.99. That’s the same price as the ad-free Kindle Paperwhite. The Kobo Aura with the exception of a smaller screen (and hence lower resolution) and different back is identical to it’s bigger brother – the Aura HD in both hardware and software specs. It’s large 4 GB memory, great light, fast 1 Gz processor and good quality display makes it one of the best eReaders around. It’s obvious competitor is the Kindle Paperwhite which it stands up to very well. It has double the on-board memory (and is expandable), the same 1 Gz processor, comparable light and similar functionality. The reason that I place this eReader 3rd in my ratings just behind the Paperwhite in 2nd place is that the text on the Paperwhite is just that bit blacker making it slightly easier to read. That’s not to say that the text isn’t very clear and crisp on the Aura – which it is. It’s just in my eyes the text isn’t quite as black as the Kindle Paperwhite’s which makes it slightly easier on the eyes.